Map of the regions of Japan. From north to south: Hokkaidō (red), Tōhoku (green), Kantō (blue), Chūbu (brown), Kansai (teal), Chūgoku (green-yellow), Shikoku (pink) and Kyūshū (yellow). 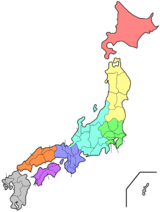 The Regions of Japan are traditional subdivisions of the nation. The regional divisions are used in many ways. These include maps, geography and weather reports. Regions are used as a basic framework for description and comparison. In Japan, the traditional regions are cultural makers. For example, according to Kunio Kishida in 1940, "The correct tradition of Japanese culture exists today not within the culture of the center, which has developed under the influence of foreign culture; but rather within regional culture." Japan's multi-decade "Comprehensive National Development Plan" emphasizes regions in serial studies of patterns of land use and regional society. The names of many businesses incorporate a regional name. Hokkaidō region: It covers the entire northern island of Hokkaidō. The largest city is Sapporo. Tōhoku region, The region is in the northern part of Honshū island. The largest city is Sendai. Kantō region:,. It is in eastern Honshū. The largest city is Tokyo. Chūbu region: It is in central Honshū. Mount Fuji is in this region. The largest city is Nagoya. Hokuriku region is in northwestern Chūbu. The largest city in the region is Kanazawa. Kōshin'etsu region is in northeastern Chūbu. Its largest city is Niigata. Tōkai region is in southern Chūbu. Nagoya is its largest city. Kansai region: or Kinki region It is in west-central Honshū. The largest city is Osaka. Chūgoku region: The region is in western Honshū. The largest city is Hiroshima. Shikoku region. The region covers all of the island of Shikoku. Matsuyama is the largest city in the region. Kyūshū region: It covers all of the island of Kyūshū. The largest city is Fukuoka. Ryukyu Islands: The largest city is Naha. ↑ Nussbaum, Louis-Frédéric. (2005). "Geography" in Japan Encyclopedia, p. 242. ↑ Griffis, William Elliot. (1883). The Mikado's Empire, p. 87; excerpt, "...rarely spoke even of Kiushiu or Shikoku as names of islands, always using the names of the do or circuits ..."
↑ Brandt, Kim. Kingdom of Beauty: Mingei and the Politics of Folk Art in Imperial Japan, pp. 218-219. ↑ Shapira, Philip et al. (1994). Planning For Cities And Regions In Japan, p. 193, citing Research Institute of Construction and Economy. (1991). "Fig. 2-7. "Regional Vitalization and Construction Administration," White Paper on Construction; retrieved 2012-4-11. ↑ Nussbaum, "Hokkaidō" at p. 343. ↑ Nussbaum, "Tohoku" at p. 971. ↑ Nussbaum, "Kantō" at pp. 478-479. ↑ Nussbaum, "Chūbu" at p. 126. ↑ Nussbaum, "Hokuriku" at p. 344. ↑ Nussbaum, "Kansai" at p. 477. ↑ Nussbaum, "Kinki" at p. 522. ↑ Nussbaum, "Chūgoku" at p. 127. ↑ Nussbaum, "Shikoku" at p. 857. ↑ Nussbaum, "Kyūshū" at p. 588. ↑ Nussbaum, "Ryukyu Islands" at p. 801. ↑ Nussbaum, "Okinawa" at p. 747.